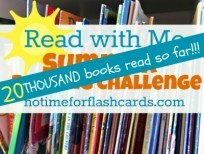 Our Summer Reading Challenge is on fire! We can do this , our goal of 25, 000 books read is totally attainable . 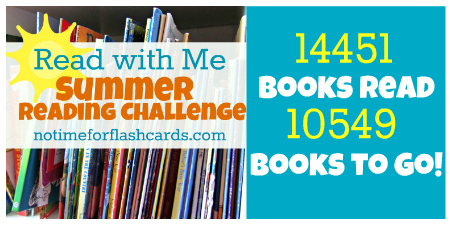 Please if you haven’t sent in your reading totals do it right now, it will take you like 45 seconds to fill out the form and it’s your entry for a chance to win the end of challenge sweepstakes too. Think of all the books you can buy with a $50 Amazon.com gift card. If you haven’t been part of our reading challenge before check out all the details and FAQ here but in a nutshell you read books , tally them , fill in our form once a week and help us reach our 25, 000 books read goal. In return each one of your entries will give you a chance to win a $50 Amazon.com gift card at the end of the summer to buy more books ( or toys, or shoes”¦ ) . Printable Tally Sheet this is an optional printable for you to keep track of your books at home all week long. Online Form this is what you fill out to add your books to our grand tally every week .This is also your sweepstakes entry form, one entry per week max. This sweepstakes is open to American residents 18 years or older. To be eligible for the sweepstakes you must fill out this form. 1 winning participator will be drawn at random, using Random.org, after the sweepstakes closes on Sunday August 26th 2012 at 8:00pm PST. The winner will receive a $50 Amazon.com gift card valued at approximately $50. After the winner is notified he or she has 48 hours to respond with their email address to send the gift card to,or another winner will be chosen at random. No purchase necessary.The number of eligible entries received determines the odds of winning. Any information gathered through the sweepstakes including email and postal addresses will not be used in anyway other than contacting winners and shipment of winnings. VOID WHERE PROHIBITED BY LAW. 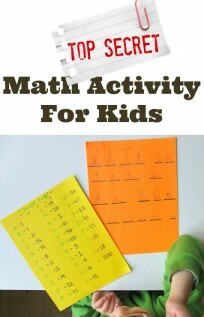 Next Post: Kids Crafts & Activities Add Yours!